99 GBP Only 3 left In stock, ready to dispatch. Climbing rope rated to hold up to 1,200 lbs. Pulley wheel includes high quality sealed bearings for long lasting smooth rotation. Fully powder coated pulley housing. Door anchor included allows you to workout at home. Challenge yourself. PULL THE PIN! Locked-N-Loaded deactivates the pulley rotation and stabilizes the handles for exercising without the pulley. PULL THE PIN and the CrossCore180® turns any workout into a rotational, multi-planar body assault. Includes: CrossCore180® complete Rotational Bodyweight Training System™ (includes training manual and training DVD). Door anchor. Heavy Duty canvas carrying bag. 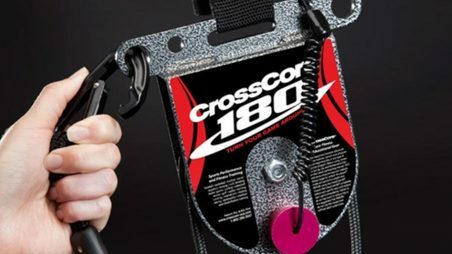 CrossCore180® Advantages: The Patented Magnetic Pin can be inserted to stop the rotation of the pulley wheel when stable movements are needed. When rotational moves are desired the pin can be removed and conveniently stored at the top of the pulley housing. Removing the magnetic pin to allow the pulley wheel to rotate freely also enables CrossCore® to act as a pulley machine by attaching a counterweight, such as a kettlebell, dumbbell or sandbag, to one end. Using two counterweighted CrossCore® units spaced eight feet apart makes for one of the smoothest cable crossovers on the market. Handles clip in at the top of the CrossCore180® for exercises where the pulley is not needed and handles need to be higher off the ground (such as knee raises and pull ups). Self levelling handles. No more readjusting the height of your handles in the middle of your workout. The CrossCore180's Patented pulley system makes this obsolete. Foot cradle padding pads the feet and arms when performing certain exercises like knee raises and hamstring curls. These cradles open and close for a snug fit on the hands and feet so the user won't slip out while exercising. Optional Ceiling/Wall Anchor allows user to create an anchor point for the strap when one is not already available. (see instructions for mounting info BEFORE installing). Take it with you! Your CrossCore180® can go with you to the park, to the gym, on vacation or wherever you'd like to go for a change of pace and it all fits into a convenient carry bag. If you are in the military, the CrossCore180® replaces all the concrete blocks, bales of wire and other crude objects you may have had to resort to for a workout in the past. Heavy-Duty climbing carabiners are rated to hold up to 5,000 lbs. Adjustable cam buckle strap is rated to hold up to 1,800 lbs. Handle webbing is rated to hold up to 2,100 lbs.